A former Vanguard Group employee sued the mutual fund giant, claiming it has operated a massive tax shelter for all of its nearly 40 years of existence. The suit, unsealed in the New York Supreme Court in Manhattan Friday, said the Malvern, Pa.-based company avoided paying hundreds of millions of dollars worth of state and federal income taxes each year. 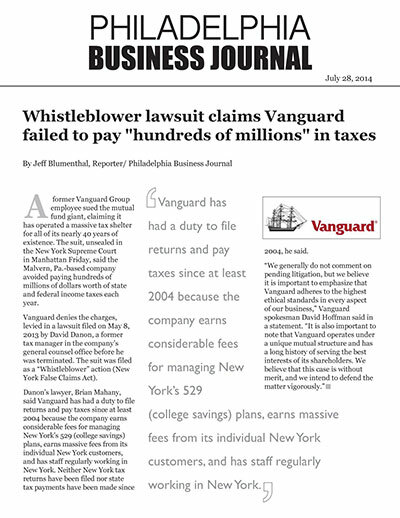 Vanguard denies the charges, levied in a lawsuit filed on May 8, 2013 by David Danon, a former tax manager in the company’s general counsel office before he was terminated. The suit was filed as a “Whistleblower” action (New York False Claims Act). Danon’s lawyer, Brian Mahany, said Vanguard has had a duty to file returns and pay taxes since at least 2004 because the company earns considerable fees for managing New York’s 529 (college savings) plans, earns massive fees from its individual New York customers, and has staff regularly working in New York. Neither New York tax returns have been filed nor state tax payments have been made since 2004, he said.